Leilani Muir, eugenic survivor has written her biography and launched it at the Alberta Gallery of Art on May 24, 2014. The event was hosted by the Living Archives on Eugenics in Western Canada (http://eugenicsarchive.ca/). 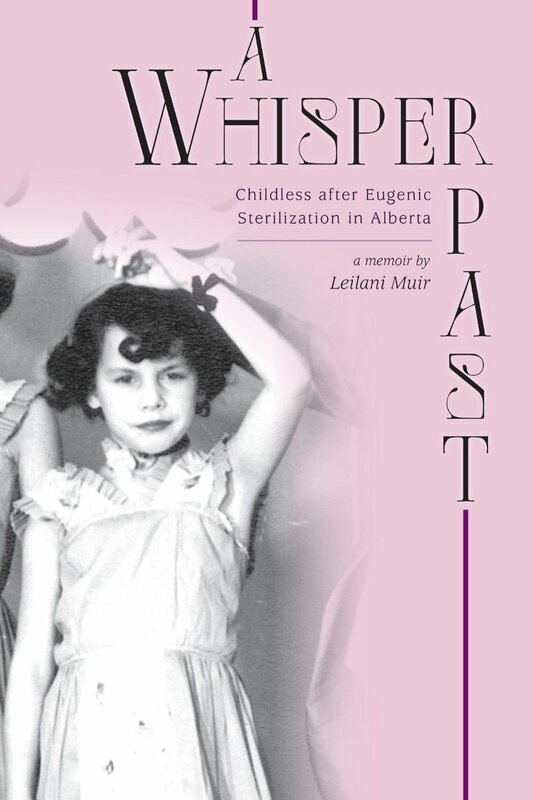 Leilani was the first person to file a successful law suit against the province of Alberta, Canada for wrongful sterilization under the Sexual Sterilization Act of Alberta. Muir lived in several small towns in Alberta until she was sent to the Red Deer institution. The education she received there did not prepare her for life on the outside, but after she left the institution and escaped from her mother’s custody and at the age of 20, she learned quickly and worked in several cities in Western Canada as a waitress, a retail sales person, and a baby sitter, caring for as many as six children at one time. Only when she married did she learn the awful truth about the sterilization. 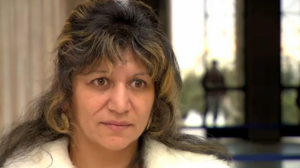 After winning her case in court, her story was featured in a documentary by the National Film Board of Canada. She spoke at several public forums in Canada, The United States and France, and she ran for election to the Alberta legislature for the New Democratic Party. Recently she was designated a Game Changer on the CBC radio show The Currents, and her story was dramatized in the play The Invisible Child at the Edmonton Fringe theatre festival. She now serves as a governing board member for the Living Archives on Eugenics in Western Canada, a Community-University Research Alliance project at the University of Alberta. Leilani’s story educates us about Canada’s eugenic past and raises awareness about the on-going discrimination against people with disabilities. If you missed the recent broadcast of We Were Children you can still watch the full movie online. It will be available for viewing until April 23. We Were Children is a 2012 Canadian documentary film about the experiences of First Nations children in the Canadian Indian residential school system. Produced by the National Film Board of Canada. For over 130 years, Canada’s First Nations children were legally required to attend Government-funded schools run by various orders of the Christian faith. ‘We Were Children’ is based on the testimony of two survivors. The film was shot in Manitoba, in Winnipeg, St-Pierre-Jolys and at the former Portage residential school, now the Rufus Prince building, in Portage la Prairie. It was produced by Kyle Irving for Eagle Vision, Loren Mawhinney for eOne Television, and produced and executive produced by David Christensen for the National Film Board of Canada. The executive producer for the Eagle Vision was Lisa Meeches, whose parents and older siblings were sent to residential schools. Meeches, who spent over seven years travelling across Canada to collect residential school survivors’ stories for the Government of Canada, has stated that the idea for the film originated from a discussion she’d had at the Banff World Media Festival. It was Meeches who approached director Wolochatiuk with the project. CBC Manitoba reporter Sheila North Wilson assisted the production by translating material in the script from English to Cree. We Were Children premiered on October 2, 2012 at the Vancouver International Film Festival, followed by a screening at the imagineNATIVE Film + Media Arts Festival in Toronto on October 18. It was broadcast on the Aboriginal Peoples Television Network in March 2013, followed by a DVD release from the National Film Board of Canada on April 12, 2013. (background information taken from the wikipedia article written on the film). Today, March 27, 2014 the Truth and Reconciliation Commission of Canada begins hearings at the Shaw Conference Centre. The hearings are open to the public and attendance is encouraged. As the TRC Mandate (1998) stated, it is not only the sincere “acknowledgement of the injustices and harms experienced by Aboriginal people” but also the community’s step for “continued healing” and “[paving] [of] the way for reconciliation” that is the overall aim of testimonies through the the context of the TRC. NO REGISTRATION NEEDED TO ATTEND. Those wishing to provide a statement to the Commission may register onsite during the event. CAN’T COME? The Alberta National Event will be livestreamed at http://www.trc.ca. Future Past: Disability, Eugenics, & Brave New Worlds. A public symposium on the history and ongoing implications of eugenics ideologies and practices for people with disabilities. Why do these issues matter? How can we address them in teaching and pedagogy, in policy and activism, and in art? On November 1, 2013 at San Francisco State University, Seven Hill Conference Center from 9:00 am – 8:00 pm. The Living Archives on Eugenics in Western Canada is co-sponsoring a conference, dinner and reception plus the screening of FIXED: The Science/Fiction of Human Enhancement. Conference organizers include: Paul K. Longmore Institute on Disability, Living Archives on Eugenics in Western Canada, and the Center for Genetics and Society. 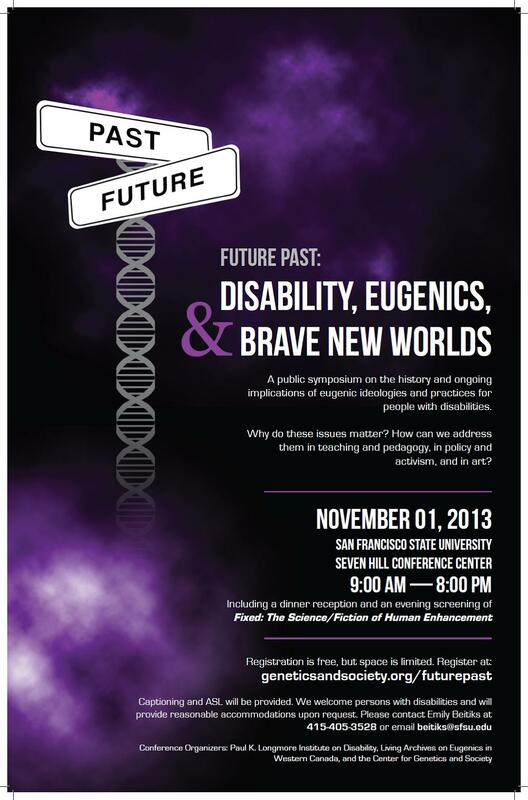 Future Past is the result of a cross-national collaboration among advocates and academics interested in gaining a deeper understanding of the long and tangled relationship between disability and eugenics, and the contemporary implications of genetic technologies to the lives and futures of people with disabilities. Many people are unaware of the history of eugenics movements in North America, yet they are disturbingly relevant today. Alexandra Minna Stern (moderator), Departments of Obstetrics and Gynecology, American Culture, and History at the University of Michigan. What are the social and ethical consequences of omitting eugenics from historical memory or misrepresenting it? What is the price of the pursuit of “human betterment” for reproductive and disability justice? What is being done – and what can be done – to increase public and student understanding of the legacies of eugenics through teaching, activism and art?